Depart from either your hotel in Bocagrande or a central Cartagena location to begin your exuberant expedition. Climb aboard your colorful chiva bus and absorb the electric atmosphere created by lively music and excited chatter. 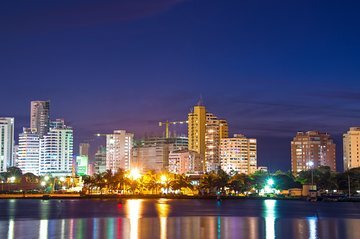 Sip refreshing rum and coke cocktails as the music bursts into life and you embark on a tour of the UNESCO World Heritage Listed walled city; admire legendary landmarks and listen to comic commentary as you sample local Colombian fritters and enjoy the festive atmosphere. Drive past the fabulous fortification of Castillo San Felipe de Barajas, a protective castle that reigns supreme from the top of San Lazaro Hill. Learn about the purpose of its construction and its ancient 14th century origin before travelling to the impressive archways of Las Bóvedas, in which bespoke boutiques and quaint craft shops sell artisan treasures. Keep the party spirit pumping as you arrive at one of the city’s most popular nightclubs; enjoy free admission and an exuberant ambience as you prepare to dance the night away. Move to Latin, electronic and salsa songs as they pulsate from state-of-the-art speakers, enjoying South American rhythms like reggaeton and vallenato (popular folk music from Colombia). When the clock strikes midnight, return to the bus and relax during the journey back to your hotel. Stay at the club until the early hours if you wish, however return transportation must be arranged independently. First of all, I think we got on the WRONG chivas bus. Not only did we initially drive around in circles dropping and picking up people and vendors, but it was like we were stuck with families that were not our own. This was a group tour with moms, dads, kids, grandma and grandpas, I dont know about you but it was not what we signed up for. After our drive around for circles we went to some small shopping mart where more peddlers would attack you like hawks. At which point we decided to was time to jet to a real bar by taxi. No this is not a bar crawl tour and no this was NOT fun. We were deceived and viator is usually trustworthy, you did us dirty in Colombia, Shame! I would say this tour would of been more fun if we had some more drinks to pregame before the Chiva Bus tour. They give you minimal rum/coke and essentially you just drive around the city. They stopped the bus at one point in front of the old city walls and then after standing on the side of the street for 30 mins being swarmed by street vendors trying to sell you stuff, we got back on the bus to then be dropped off in front of 2-3 bars. If you walk about a block past where they drop you off, you'll find a Salsa bar worth going into otherwise the other bars just got crammed with tourist which eventually we had not choice to leave because it was crowded. After the difficulty we had waiting to find the bus, there was no contact information on the reservation confirmation page and we were just waiting and asking around at the hotel plaza, I wouldn't recommend it. I don't even know how were lucky enough to talk to someone who figured out what bus we were waiting for. I would highly recommend just booking through one of street vendors and having some drinks before you get on the bus! Do NOT book this through Viator. My friends and I booked this tour several weeks in advance. We tried calling both the regular contact number and emergency number for Gray Line to set up our hotel pick-up the tour operator listed on our voucher, and no one would answer. We finally decided to go directly to the meeting area since it was nearby. Once we got there, it was total chaos. There were several tour operators, and none of them were from Gray Line and no one knew what Viator was. A large group of other people waiting for the tour got on a bus right away because they booked through their hotel. When a tour operator finally showed up we assume he was from Gray Line, but it was so confusing that we still don't know he let us on the bus an hour later, so we missed a good chunk of the tour. This experience was so frustrating and unprofessional. If you choose to do a Shiva bus tour, book through your hotel or a local agency - DO NOT book through Viator. This is a must do!! This was so much fun!! Highly recommended! Fun time with a bit of music culture history lesson that was sprinkled in between drinks, great music and great energy Highly recommend. Really not much of a tour, just rode around in an old bus with some rum and coke. Stopped at a few places of no interest and had to dance. Thought was a bilingual tour but we were the only English speakers, but that was OK. Difficult to put together an English tour as vast majority of tourists are Spanish speaking. Really fun tour. Figuring out where to meet your tour guide and who's supposed to pick you up can be confusing and somewhat stressful which seems somewhat consistent from my experience when using Viator tours particularly in foreign countries. Overall though fun tour, fun guides although we seemed to ride around the same area for an hour for some reason. This was a great time! We had a great guide and had a lot of new friends by the time the night was over. The city is so beautiful at night! A must do in Cartgena! Did it on a Friday night. Quick way to see a lot of the city at night. We stopped at a couple locations and toured. We got to eat some empanadas and arepas for free..Rum and a fruit flavored soda mixer provided... drink fast though because it stops right before you end up at the nightclub. The night club had a good mix of english and spanish music. Do it!